When the trailers for WE'RE THE MILLERS started making rounds, I had no intention of watching it. It just looked dumb. Another low-brow comedy catering to the lowest common denominator. Then the reviews starting creeping out and the general consensus seemed to be that it wasn't all that bad. It wasn't going to win any awards and it's doubtful to be on anyone's top ten list for 2013, but it was fun. So with that little bit of encouragement (and Jennifer Aniston as a stripper) I finally relented and, you know, I don't regret it. It's not a great movie, but it's definitely got some laughs thanks to a pretty nice bit of casting. It's a road trip movie with familial themes but it never slaps you upside the head with them. The movie is about small-time drug dealer David Clark (Sudeikis). He's robbed one night by a gang of thugs who make off with all of his drugs and cash, leaving him on boss man Brad Gurdlinger's (Ed Helms) bad side. But he's willing to forgive David and even give him a nice little payday if he'll run down to Mexico, grab a "smidge" of marijuana, and bring it back across the border for him. David reluctantly agrees and formulates a plan of bringing the drugs across the border while attracting minimal attention: pose as a family on vacation and cross the border in an RV. But he's going to need a family. He recruits his stripper neighbor Rose (Aniston), a homeless punk (Emma Roberts), and a sheltered neighbor kid (Will Poulter) and soon the "Millers" are on their way to Mexico. two weeks ago. So, the seeds are all there for the finale we all expect but it's nice to see it's all thought out better than I expected from a drug comedy. The main reason this movie works as well as it does it the casting. 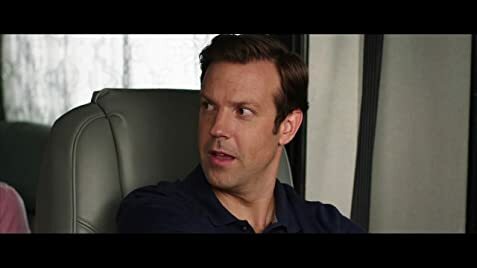 I stopped watch "Saturday Night Live" before Jason Sudeikis joined the cast but I loved him in HORRIBLE BOSSES and he was one of the funnier bits of MOVIE 43, and WE'RE THE MILLERS gives him the chance to be the main character. He handles it well. I love his sense of humor and his comedic timing, and some of his line deliveries had me rolling. The other highlight is Nick Offerman as a fellow RV vacationer whose family the Millers meet and can't seem to shake. An All-American sort of dad with a distaste for profanity and the ultimate family man, Offerman's hilarious as he goes from leading his family in campfire songs one minute and offering the Miller's the chance for a little swinging the next. His wife Edie is played by Katherine Hahn and the two work perfectly together. The rest of the cast is fine enough. Aniston still seems a little odd delivering the raunchy dialogue but she's still hot, and so is Emma Roberts. Despite any flaws, the film works because the main four (Sudeikis, Aniston, Roberts, and Poulter) had a real good chemistry. WE'RE THE MILLERS was a lot funny than I ever anticipated, even when it wasn't firing on all cylinders. It was a fun comedy to help close out the summer and it sets itself up for a sequel with the Millers that, honestly, I'm not adverse to. I'd be down for another adventure with the family. The 16th biggest grossing film of 2013. David Clark: We are all now officially international drug smugglers. Add it to the resume. Kenny's watch disappears when on the sidewalk outside the Albuquerque Sunport, just before the Millers get the RV. It appears in all previous and subsequent scenes. At the very end of the credits, a male voice says, "Adiós, amigos."